Around the globe, sports fans invariably express support for their teams by collecting a wide variety of memorabilia. One commonly collected item is the jersey. These are often worn or hung in pride of place in the homes of true fans. Jerseys, however, can present some unique challenges with regard to longevity, when framed in a typical commercial manner. The primary role of conservation is to ensure that artifacts remain in a condition that keeps them accessible to future generations. Commercial framing may or may not have these same goals. 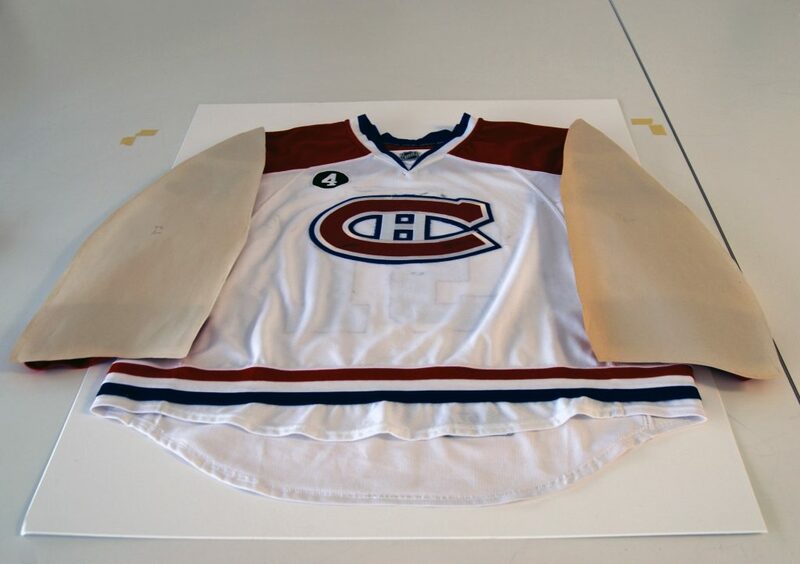 So, when a commercially framed jersey arrived in the conservation labs here at the Canadian Museum of History for display in the Hockey exhibition, steps were taken to ensure that it would remain in as good a condition as possible. The visual appearance of a jersey is often the deciding factor in a commercial framing project. This means that all kinds of things may be used to display the jersey “just so.” Screws, nails, staple, straight and safety pins, plastic-price-tagging guns, double-sided tape, etc. are just some of the possible materials we have seen used. 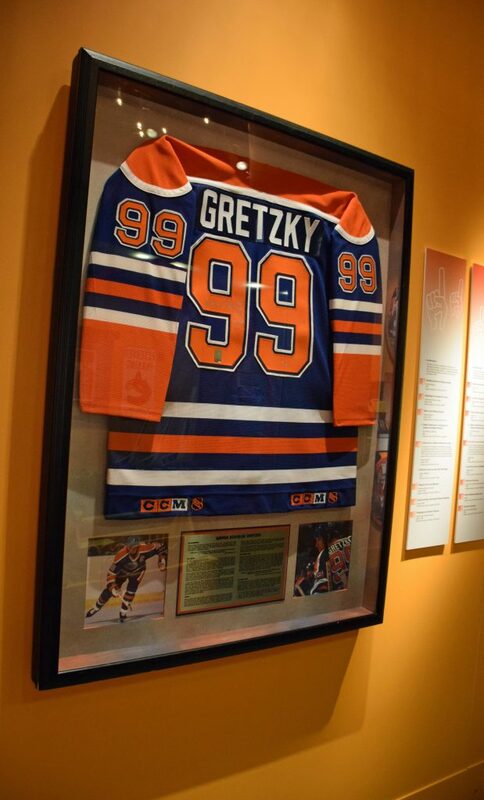 The commercial framing of this Wayne Gretzky jersey was altered to make use of more conservation friendly methods and materials, while retaining the original look. Photo: Canadian Museum of History. In the Museum’s conservation labs, we wanted to achieve the same look while using more conservation-appropriate methods and materials. When we received the framed work, the body and arms of the jersey had been lined with paper-faced foam board (Fome-Cor®) to help provide shape; these were switched out for acid-free archival quality 4-ply matboard. The shapes of the new matboard forms were also refined to better fill out and support the shoulders of the jersey. The double-sided tape affixing the hem of the jersey to the backboard was removed as well. Small nails and pins were taken out of the hem, the wrists and the sleeves. 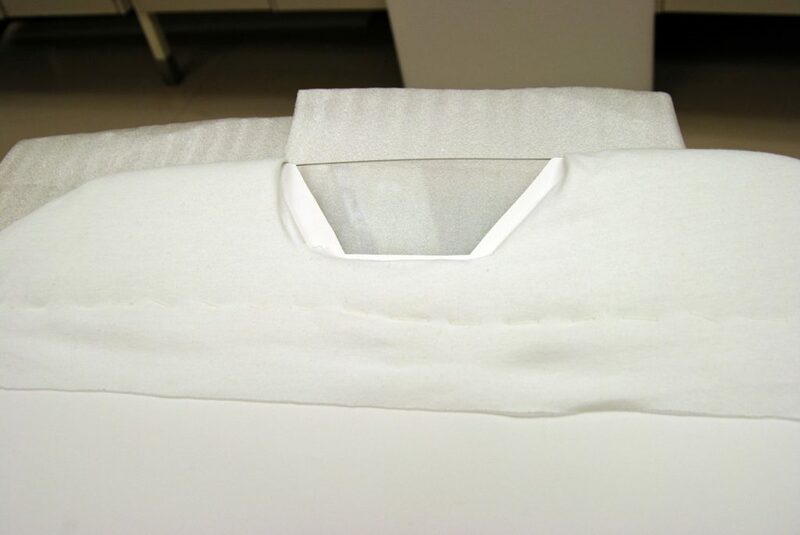 The jersey had been mounted with a single screw through the original Fome-Cor in the open area of the v-neck; this attachment method was retained in the new mounting. Because the back of the jersey was what people would see, the v-neck mount would not show. The padded Plexiglas support was riveted to the secondary Plexiglas piece and to the backboard. Photo: Canadian Museum of History. Additionally, a sheet of polyester — a thin, relatively stable plastic film — was placed behind the jersey to separate it from the original, potentially acidic, backboard. The arms of the jersey were then pinned in place with a couple of very fine straight pins, and a couple of stitches were placed in the hems of the arms to ensure that the matboard inserts would not slip out of place. For our Hockey exhibition, we were also asked to imitate the commercial framing style with a Carey Price game-worn jersey from our collection. In this particular case, it was the front of the jersey that the curators wanted to show. Paper patterns were created by tracing the shapes of the arms and body of the jersey. These were then used to make the matboard inserts that help to support the jersey and provide the desired shape. Photo: Canadian Museum of History. This presented a challenge in terms of mounting the jersey, as the hanging hardware would show if we used the open v-neck space. Together with staff from the exhibition preparation team, a plan was devised to build a lightly padded hanger of acrylic sheet (Plexiglas®). This would fit into the shoulders of the jersey, then be attached to a second, thicker piece of Plexiglas and to the backboard with metal rivets. This thicker piece of Plexiglas provides the necessary gap between the backboard and the jersey, to keep the jersey from being squished when attached to the board. The same methods we had used in altering the original commercially framed jersey were repeated here — using archival quality matboard inserts, straight pins and a few stitches — all to mimic the look of the jerseys hanging on walls across the country and around the world. The finished, faux-commercially framed Carey Price Jersey. Photo: Canadian Museum of History. 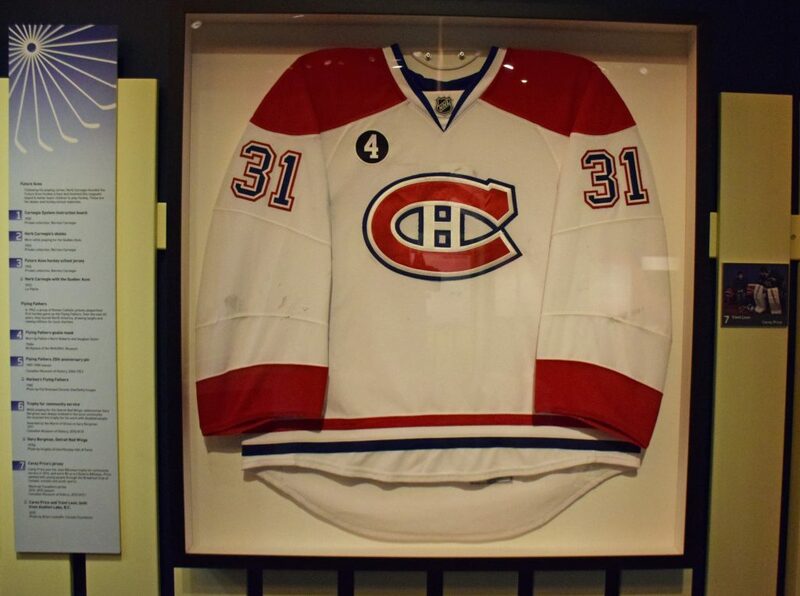 Come check out the Hockey exhibition at the Canadian Museum of History from March 10 to October 9, 2017 to see if you can spot the altered and faux-commercially framed jerseys!